You are here: Home / Compresssion Stockings / Are Compression Stockings the Gold Standard for Healthier Legs? Are Compression Stockings the Gold Standard for Healthier Legs? Compression stockings can be of great benefit to boost circulation throughout the legs particularly when our job requires us to sit or stand for long periods of time and/or if we are afflicted by venous conditions such as varicose veins, spider veins or swelling of the legs from fluid retention. Support hose and graduated compression socks, stockings and pantyhose are most frequently the “Go To” non-invasive remedies of choice to prevent and lessen the symptoms and discomforts of less severe venous conditions. Even though compression stockings are not a cure for the underlying conditions they can significantly slow or sometimes even halt the progression of vein disease. There are a multitude of factors that can impact the health and fitness of our legs. Among the elements affecting the course of our leg health are the occupations we work in, the genes we have been dealt from our ancestors, and more or less healthy lifestyles, which certainly play a significant role in our general wellness and the health of our legs. Deceptively many people may think of a job as “cushy” if they don’t have to move around much or where they can sit in a chair all day. However, make no mistake, as convenient as that may sound, our bodies are not meant to spend most of the day immobile or in a sedentary position. 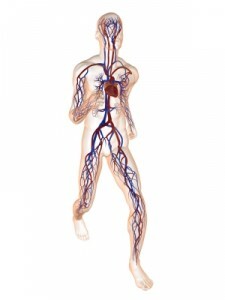 You may know this or be surprised to learn that some of the body’s built in functions to aid blood circulation actually depend on movement such as walking to be activated and if we just sit these functions literally shut down. The body function I’m talking about is also referred to as the “calf muscle pump”. The calf muscles not only help to propel our legs forward but at the same time when the muscles tighten and relax they mimic a “pumping” action by gently squeezing the leg veins with each contraction. Each of these rhythmic pumping intervals in turn helps to push the blood along in the veins back towards the heart and lungs to be reoxygenated, functioning like a well-oiled machine. You may be asking – Why is this so important? The real benefit of the calf muscles pump assistance is that it reduces the stress and strains on the veins itself and in particular on the one-way valves inside the leg veins. These valves are designed to prevent the blood from flowing back down the legs, working against the gravitational force. Consequently, the more calf muscle action we can achieve throughout the day (through walking or leg and foot exercises) the less work our leg veins have to perform against the pull of gravity. When we have to remain in an immobile position for long periods of time the graduated compression of the compression stockings or pantyhose can substitute the squeezing effect of our calf muscles to help circulate blood and fluids more efficiently and prevent it from pooling in the legs, which often manifests itself with swollen legs and ankles. Graduated compression begins with the tightest squeeze at the ankle area and gradually lessens the compression as the sock or stocking progresses up the leg with the pressure being the lowest in the upper thigh area. Compression and support hosiery cannot only boost circulation but also energize and invigorate the legs by eliminating tired, heavy and sore feelings. As an added bonus, you also no longer have to be embarrassed wearing compression stockings and support hose. The latest styles, colors and designs of compression stockings are virtually indistinguishable from high-street fashion tights or stockings.